The historic university city of Heidelberg on the river Neckar is part of the Verkehrsverbund Rhein-Neckar tram network. Our first visit starts in 1998 with the mainstay of the fleet being the ‘standard’ Düwag type cars operating on this 20.7 km system on metre gauge track. We return in 2007 where some of these cars are still in service along with newer low floor Duewag cars and also new Bombardier cars. Filming takes place at the busy Bismarck-Platz, Hauptbahnhof and Berg-Heimer Straße and Mittermailer-Straße plus other locations. There is a 61 km interurban light railway, the OEG, that links the centre of Heidelberg with neighbouring Mannheim. Many of the units on this system are made by Duewag and have received a very high level of refurbishment. These ‘step entrance’ cars run alongside newer low floor cars and make a very interesting comparison. Our cameras travel on this service to reach this modern commercial city. Here we see Duewag, ADtranz and Bombardier cars in action together in a variety of smart bright liveries. Some early 1960’s Düwag cars are filmed which have low floor centre sections. The Mannheim system is 59.2 km long on metre gauge track. Also linked to this system is Ludwigshafen and the wine growing town of Bad Dürkheim. We present a short ride from Mannheim to Bad Dürkheim filmed in 1994. In comparison we visit Wüzburg in northern Bavaria. Set on the river Main this beautiful baroque city has a small system of some 18.8 km on metre gauge track. Our first visit is in 1998 where some older Duewag cars are still in service alongside new LHB cars. We returned in 2007 to see older LHB cars with low floor sections added, and newer LHB cars offering 100% low floor access. 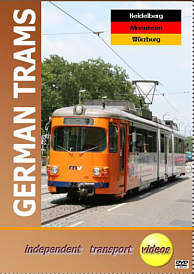 This video will be an excellent companion to our German Trams – 1 programme which is now available. Duration : 92 minutes (approx).